Mary Kerr’s feature-length documentary debut tells the extraordinary story of Craig Castaldo - a.k.a. Radioman - a New York film set ‘mascot’ who has appeared fleetingly in over 100 features, beginning with The Bonfire of the Vanities in 1990. Defined by his ever-present portable radio - slung like a medallion around his neck - he’s overcome homelessness and alcoholism to carve himself a niche on the outskirts of the movie industry. Like Castaldo himself, as a film Radioman is star-struck and features a celestial line-up of talking heads, with George Clooney, Johnny Depp and Matt Damon among the interviewees. Radioman suffers by comparison to Richard Press’ similar but superior Bill Cunningham New York, which follows another Big Apple bicycling icon. That documentary got inside the world of the enigmatic fashion photographer with sublime sensitivity. Here Kerr hands over a certain amount of control to her subject, who occasionally takes charge of the camera to conduct his own interviews, but ultimately she fails to give Radioman sufficient time to shine. At a mere 65-minutes the film is far too slight; Castaldo’s back-story and experience of homelessness are imparted cursorily, with his recurring role on 30 Rock (perhaps his most notable acting achievement) perversely relegated to the end credits. Radioman is not without insight however, identifying in Castaldo a long-standing desire to be noticed and a pride in what he considers to be his craft. And - although A-listers seem to be queuing up to sing his praises - Kerr leaves us with the impression that many of these are phoney friends when a trip to LA during Oscar season leaves Radioman feeling very much the outsider once again. 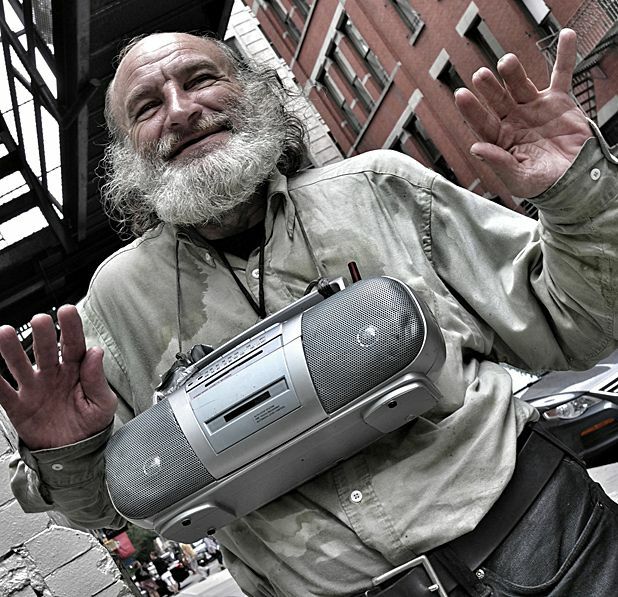 Documentary about Craig Castaldo, aka Radioman, a formerly homeless New Yorker who has become a mascot of the city, appearing fleetingly in over 100 films with his trademark radio slung around his neck. Not without insight, the film is too short and Castaldo is not given enough time to shine.